Social scientists have long argued that images play a crucial role in shaping and reflecting political life. This role is heightened by the bombardment of images that people experience today through many communications channels, from television to social media. Digitization has both increased the presence of images in daily life and made it easier for scholars to access and collect large quantities of pictures. However, using images collected in observational settings as data for social science inference is an arduous task. Fortunately, recent innovations in computer vision, the subfield of computer science concerned with automated image analysis, can reduce the costs of using images as data. The goals of the lecture will be: a) to discuss the theoretical reasons why social scientists should be interested in studying visual content, b) to introduce the principles of deep learning and convolutional neural nets, c) to provide an overview of computer vision techniques that can be useful to social scientists, and d) to discuss social science research that currently uses state of the art computer vision techniques. 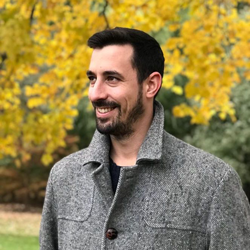 Andreu Casas is a Moore Sloan Research Fellow in the Center for Data Science at the New York University, where he works at the Social Media and Political Participation (SMaPP) lab. He received his Ph.D. in political science at the University of Washington in 2018. His research interests encompass the areas of political communication, public policy processes, and computational social sciences. He is particularly interested in how social movements and interest groups influence the political agenda and the decision making process in the current media environment. His methodological interests and strengths are natural language processing (text as data), computer vision (images as data), and machine learning and artificial intelligence in general. He is currently involved in several NSF and ERC-funded projects implementing both text as data and computer vision techniques to study legislative politics, public opinion change, political mobilization, and the causes and consequences of exposure to dissimilar political views. His work has been published in top academic journals such as American Journal of Political Science, Annual Review of Political Science, Political Research Quarterly, and American Politics Research.